Comprehensive and printed to a high standard by Cartograf of Italy. Detailed instructions. 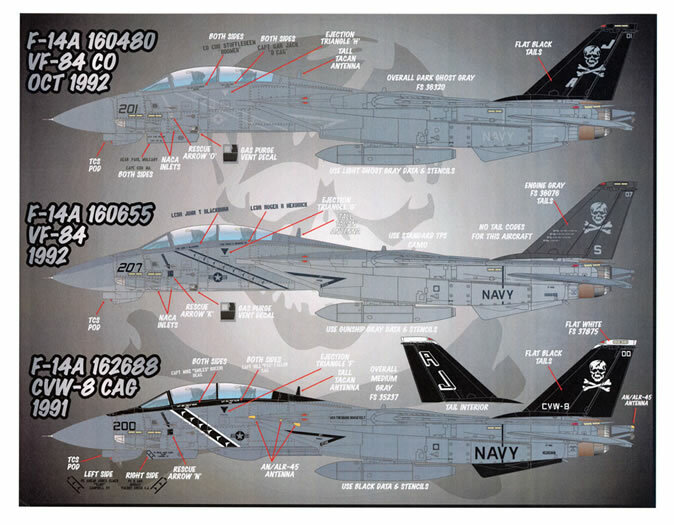 A really first rate product from the guys at Afterburner Decals providing comprehensive markings for a series of striking machines in varying colour schemes, all wearing the fabled skull and cross bones markings of VF-84. If ever there was a set of aircraft markings that have truly endured it would have to be the skull and crossbones. Worn by aircraft U.S. Navy since 1943 when it was emblazoned on the flanks of the Vought F4U Corsairs of VF-17 they have been worn on all of the major fighter aircraft operated by the U.S. Navy under the custodianship of four different squadrons. 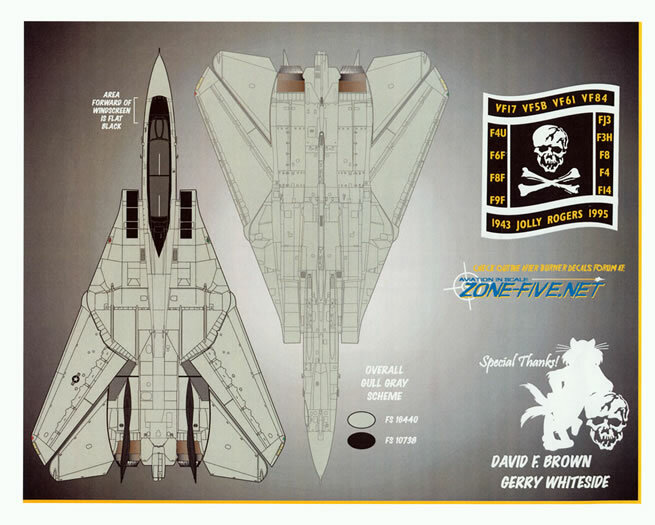 This new release from Afterburner Decals concentrates on the time between 1981 and 1994 when ‘the bones’ were worn by the F-14As of CVW-8s VF-84. 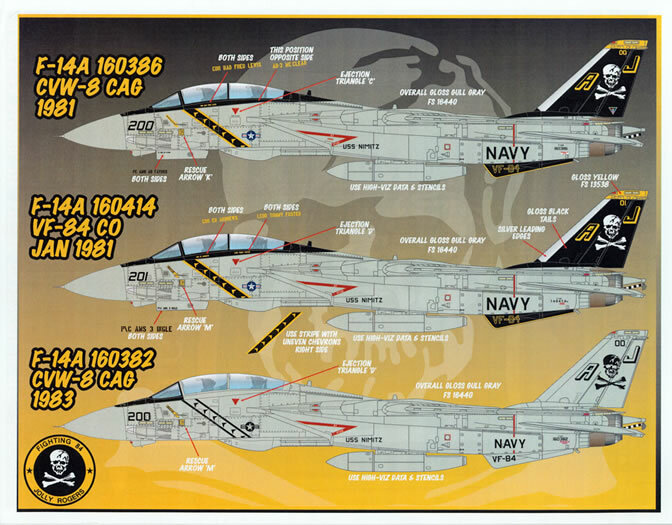 Markings are provided for a total of eight aircraft in 12 different guises and paint schemes. 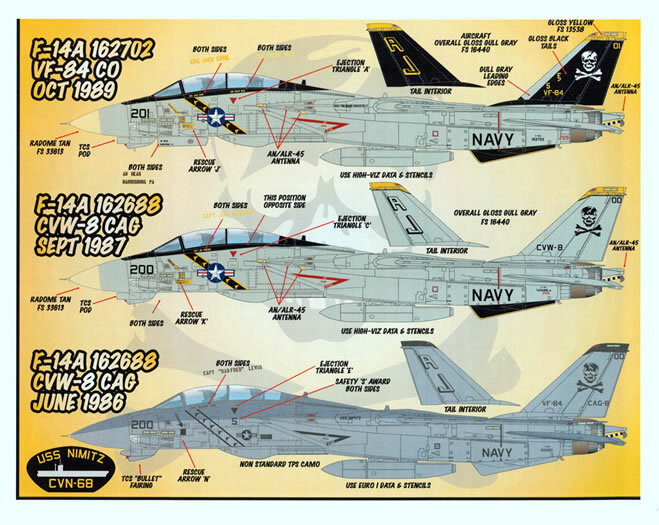 Bureau number 160386, Modex 200, the squadron’s CAG aircraft from 1981 when they were aboard the USS Nimitz. The machine is in the short-lived and appealing overall FS 16440 gloss gull grey with black vertical stabilisers and yellow edged ventral strakes. All markings are in glorious full colour. Bureau number 160414, Modex 201, the squadron commander’s assigned machine January, 1981 aboard the USS Nimitz. In overall gloss gull grey with full colour markings. 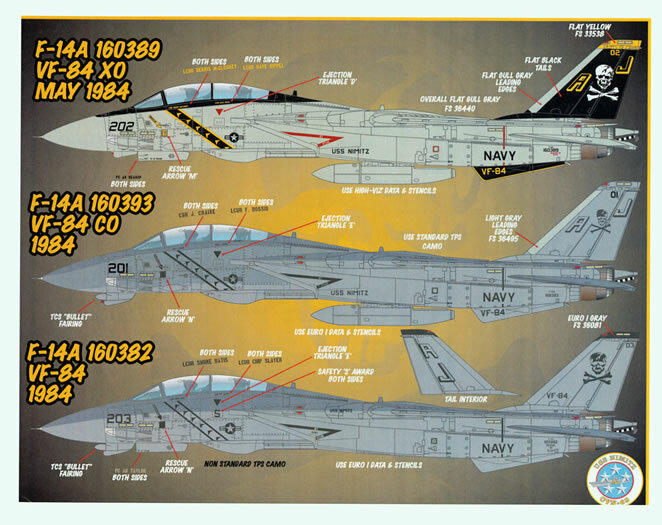 Bureau number 160382, Modex 200, the squadron’s CAG bird aboard the USS Nimitz from 1983. In overall gloss gull grey with subdued black only markings. Bureau number 160389, Modex 202, the machine assigned the squadron’s Executive Officer in the May of 1984 aboard the USS Nimitz. In overall gloss gull grey with full colour squadron markings with lo-viz black national insignia. Bureau number 160393, Modex 201, the Commanding Officer’s aircraft aboard the USS Nimitz, in 1984. In full standard Tactical Paint Scheme (TPS) comprising FS35237 medium grey and FS36320 dark ghost grey over FS36375 light ghost grey. All markings are in lo-viz greys. Bureau number 160382 again. This time wearing as a line bird wearing Modex 203. Aboard the USS Nimitz in 1984. The machine is wearing a non-standard TPS comprising FS36320 dark ghost grey over FS36375 light ghost grey. All markings are in lo-viz greys. 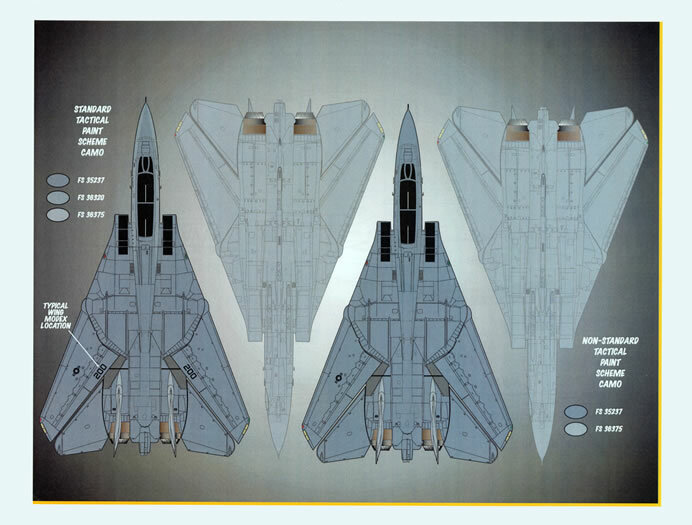 Bureau number 162702, Modex 201, the Squadron Commander’s aircraft aboard the USS Theodore Roosevelt in the October of 1989 and back to the overall gloss gull grey scheme with full colour markings. The forward end of the radome is painted in FS33613 radome tan. Bureau numuer 162688, Modex 200 the Squadron’s CAG bird from the September of 1987. She is in overall gloss gull grey with modified full colour squadron markings. 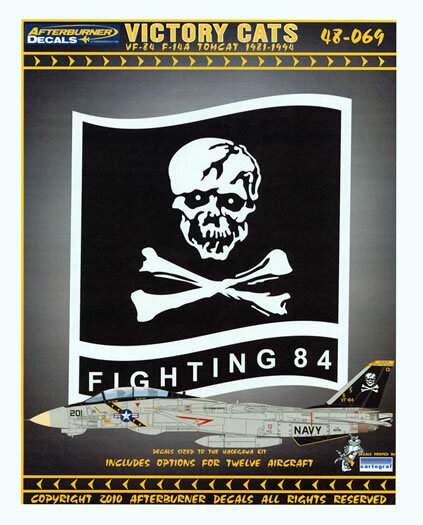 Bureau number 162688 again this time from June of 1986 as the squadron’s CAG bird aboard the USS Nimitz and wearing full TPS with low-viz grey markings. Bureau number 160480, Modex 201, the Commanding Officer’s assigned machine from the October of 1992. It wears an unusual scheme of overall dark ghost grey. The vertical stabilisers and rudders are in flat black with the rest of the markings in light ghost grey. Bureau number 160655, Modex 207, a line bird from 1992 aboard the USS Theodore Roosevelt. In standard TPS with FS3076 engine grey vertical stabilisers and rudders and low-viz gunship grey markings. 6” x 4¼” one that contains black only markings. The decals are in perfect register and exhibit an absolute minimum of carrier film around their edges. There is a myriad of stencil data provided in two different greys as well as black and full colour. Decals are provided for the slime lights as well as for the walkways atop the intakes. 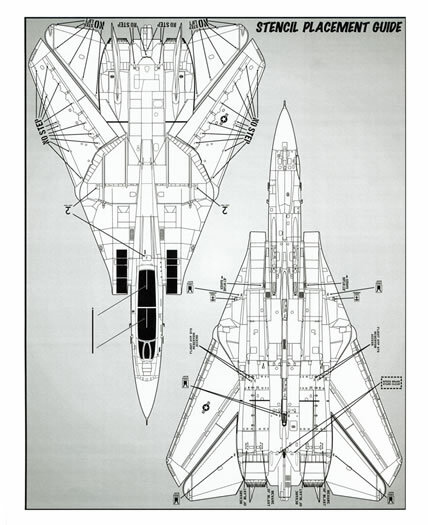 Stencil data placards for the undercarriage legs as well as the ejection seats. 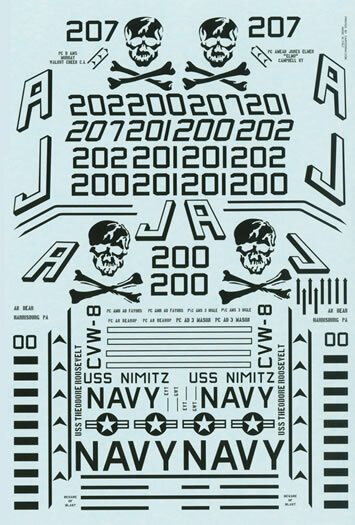 The decals are ‘sized’ for the Hasegawa kit. 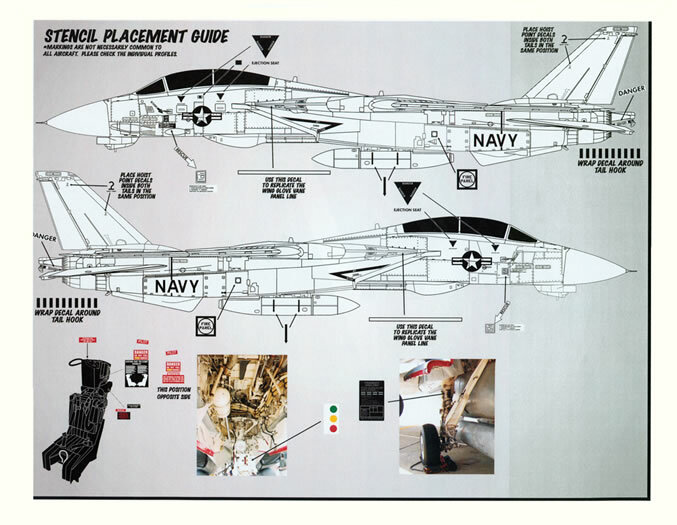 As with all of the Afterburner sheets, the supporting information is what sets their sheets apart from the competition. You are provided with five A-4 sized sheets (with printing on both sides bar one sheet). The sheets are more than simple placement guides. They provide you with full colour left hand side profiles of each option along with comprehensive advice of what camouflage colours were worn by the aircraft and the colours of its markings. Large black and white line drawings of the left and right hand sides of the fuselage as well as upper and lower plan views are provided to show the stencil data (printed in large letters) and arrowed to its location and to show placement – great for us “older gentlemen” with failing eyesight! This is a really first rate product from the guys at Afterburner Decals. 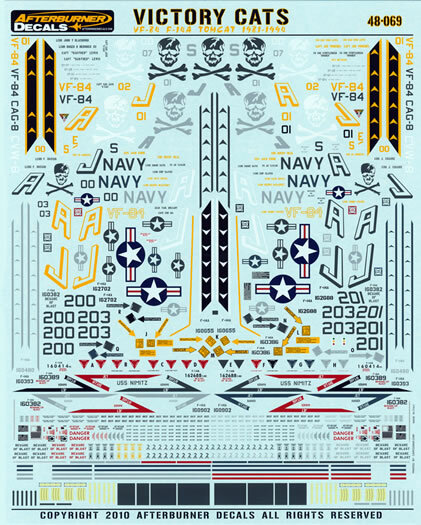 It provides you with comprehensive markings for a series of striking machines in varying colour schemes but all wearing the fabled skull and cross bones markings of VF-84.